27 March 2017: a new brief piece of mine on teaching migration and refugee history appears on IEHS ONLINE, the website of the Immigration and Ethnic History Society. My Spring 2017 course, Migrants and Refugees in the Middle East, meets Tuesday evenings, and it seems like each week I am revising my course materials to speak to rapidly changing public attitudes and policies towards migrants from the region. Migrants do not “pour in” to places. Refugees do not arrive in “flows” or “waves.” And migrants are not vectors for a terrorist contagion, their bodies carrying within them the “seeds” of radicalism. Border walls do not stymie migration because walls are not levies and migrants are not water. Migration does not work that way. Now more than ever, it is critical that we talk about migration systems. This blog post accompanies another piece (which appears HERE) to offer new readings and learning modules on how to “rethink” migration history through systems-based historiography. On April 4, Fresno State will host speakers from US CIS, a variety of organizations devoted to resettlement of Syrian refugees, as well as Dr. Keith Watenpaugh, historian of refugees and human rights at UC-Davis. The all-day event features expertise on all sides of the Syrian refugee issue and will hopefully continue campus-community conversations about the dozens of Syrian refugee families resettled in California’s Central Valley. Fresno is a city with a deep and rich history of refugee relocation. Students will learn more about the Syrian conflict, the necessity for refugee resettlement, and new challenges faced by professionals working in this field. All events are free and open to the public. Please email me at sfahrenthold @ csufresno.edu to coordinate class visits or press interviews. Ahlan wa Sahlan and Thanks! 8 February 2017: Tropics of Meta: Historiography for the Masses has published my brief piece on Donald Trump’s 2017 Executive Order in relationship to the first “Muslim Ban” in American history: Pres. Woodrow Wilson’s Executive Order 2932 (1918). Trump’s proposal is that we grant his administration a state of exception with regard to Middle Eastern migrants and refugees. With that permission he would suspend a century of legal protections built after Wilson’s 1918 executive order in order to reinstitute legalized discrimination against Muslim immigrants, overtly on the grounds of nationality and covertly through religious identity. Trump couches his request in rhetoric borrowed from the “War on Terror,” language which jumps the shark by implying a connection between terrorism and Middle Eastern migration despite all evidence to the contrary. No, Trump is not the first president to try to ban Muslim immigration, but with luck, lawyers, and migration/refugee advocates aligning against this executive order, Trump will be the first to fail to do so. The essay is based in part on research done for my first book on World War I in the Syrian diaspora. The 9th District’s decision to not lift the stay on President Trump’s EO mirrors the result of Wilson’s wartime orders, but the White House’s announcement today that it intends to issue a brand new executive order restricting immigration from the Middle East also, sadly, repeats the experience of 1918. Bedross Der Matossian, Sergio La Porta, Laura Robson, Devin Naar, Janet Klein, and me at the Ottoman Minorities Workshop. 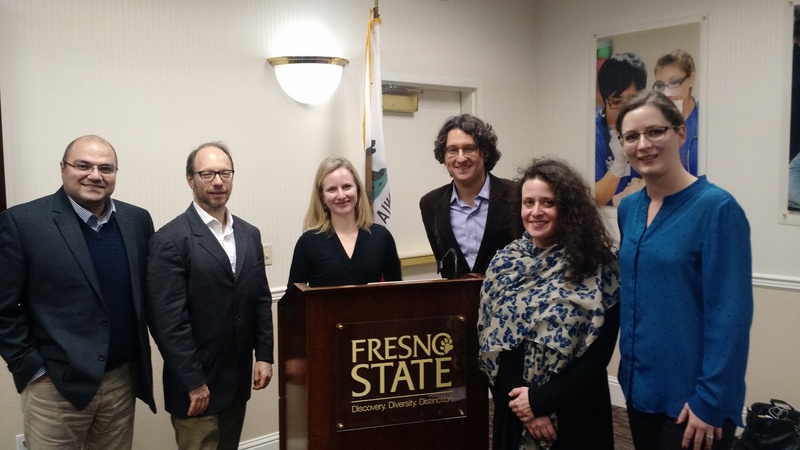 3 February 2017: today a workshop on Religious and Ethnic Minorities in the Ottoman Empire brought together four scholars working in Armenian, Kurdish, Assyrian, Sephardic, and Arab Christian histories to Fresno State. The meeting was co-organized by the Islamic Studies lecture series, the Armenian Studies Program, and the History Department, and included speakers Janet Klein, Devin Naar, Bedross Der Matossian, Laura Robson, and myself. 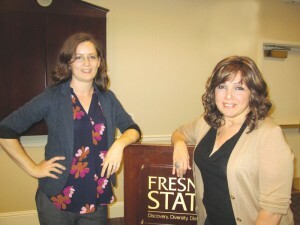 Fresno State’s press release can be viewed at this link. We had a morning roundtable discussing the concept of the minority as it has been used in Ottoman and Middle Eastern historiography, about the problems inherent in conflating “minority” with non-Muslim or using it in historical cases where is was not meaningful, and about the politicization of the term within laws directed at the Middle East following the First World War. We discussed minoritization and how the imposition of the logic of minorities and majorities in late Ottoman contexts rendered the category useful for non-dominant groups in the Middle East. We also had a conversation with Fresno State students about the pragmatics of doing historical research in Ottoman and Middle Eastern archives. In the afternoon, we had a private meeting to discuss further inquiry into the concept and ways to continue the conversation, both within our scholarly community and with with general public. We planned a series of publications that this group will roll out to prompt further research on minorities. More news on that as it develops. The day capped off with a Keynote Address by Laura Robson called “War, Peace and the Making of Minorities in the Post-Ottoman Middle East, 1919-1923.” Dr. Robson’s talk focused on the first refugee resettlement programs initiated by the League of Nations in the Arab Middle East after the First World War. She argued that the invocation of rhetoric over the protection of religious/ethnic minorities in the region created new hierarchies in the League’s provision regime and that the international organization invested itself in “unmixing populations” along the lines of this understanding of minorities as compact, moveable, and non-Muslim groups. A new politics of “minorities and majorities” emerged as a result, and we continue to see the legacy of this politics in international legal structures today. 1 February 2017: Trump’s January 27 Executive Order, colloquially understood as the #MuslimBan, sparked immediate protest at airports and initiated a series of federal court challenges which are ongoing. As a scholar of Middle Eastern migration I am watching these developments with trepidation. I have resolved to respond to these developments with a series of publications in a public humanities vein (more on that as it develops). More generally, as an educator working with students who have been impacted by this unconstitutional and impracticable executive order, I want to do what I can to highlight the various ways that immigration bans and restrictionist policies hurt my campus community at Fresno State. This week I had two interviews with local media: a television interview with ABC30 in Fresno, and a conversation with the Fresno Bee. 28 December 2016: this spring I’ll be at the Organization of American Historians (OAH) annual meeting in New Orleans to join a Roundtable in Arab American History. The session was solicited by OAH’s Program Committee in the interest of incorporating Arab American studies into the organization’s coverage of Asian American history. Sarah Gualtieri, John Tofik Karam, Sally Howell, Charlotte Karem Albrecht, and I will discuss new research in this field and its capacity for opening up the study of pan-American spaces through diasporic networks. The session is on 6 April at 2 pm, and can be viewed on the OAH program here. Abstract: This roundtable brings together five scholars with extensive publication records in Arab American studies to discuss the fruitful intersections of their research and teaching with Middle East, critical ethnic, Muslim American, Latin American, and queer studies. They will focus on three topics: 1) the ways our methods track migrants who circulate across multiple archival regimes; 2) the importance of conceptualizing Arab America as an expansive process-oriented terrain that pushes against the territorial determinism of area studies and of nationalist historiographies, while not losing sight of the site-specific microhistories in, for example, Detroit and San Paulo; and 3) the ethical challenges of our scholarship as we encounter the destruction of state archives in the Middle East, face road blocks in accessing displaced persons, and confront the pernicious effects of anti-Arab immigrant discourse in the United States and beyond. 7 December 2016: author Michael Rettig passed this link on to me, including his review of Elyse Semerdjian’s talk here on campus. Her presentation, “Ottoman History at the Margins,” is the first installment of the Islamic Studies symposia series I organize here at Fresno State. The series is dedicated to kick-starting conversations about Islam, Middle Eastern history, and the diversity of Muslim societies between our campus community and the Central Valley community. To read more about Dr. Semerdjian’s talk, please read Michael’s astute summary for Hye Sharzhoom at this link. 22 November 2016: pleased to share that my 2014 dissertation, Making Nations in the Mahjar, has been awarded the Syrian Studies Association’s 2016 dissertation award for best new work on Syria. SSA Prize Committee Chair Charles Wilkins made the announcement at this year’s Middle East Studies Association annual meeting, reproduced on the SSA’s Facebook page here: “The Prize Committee of the Syrian Studies Association is pleased to announce the prizes of the most outstanding dissertation. The committee considered dissertations completed between 1 July 2014 and 30 Jun 2016 and articles or book chapters published between 1 July 2015 and 30 June 2016. The committee was made up of Charles Wilkins (chair), Laura Ruiz de Elvira Carrascal, Hasan Kayali, Stephennie Mulder, Lorenzo Trombetta, and Tina Zintl. Stacy Fahrenthold, “Making Nations, in the Mahjar: Syrian and Lebanese Long-Distance Nationalisms in New York City, Sao Paulo, and Buenos Aires, 1913-1929,” Ph.D. Dissertation, Northeastern University, 2014.